The stamp show Harry Potter with a wand. The Harry Potter films brought J.K. Rowling\'s magical world to the screen, giving physical shape to the characters, creatures, and places that had lived in readers\' imaginations since publication of the first book. The U.S. 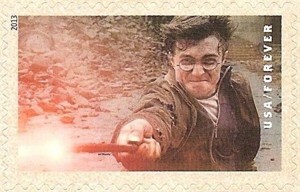 Postal Service celebrated that magic with a 20-stamp souvenir booklet featuring stills from the award-winning Warner Bros. movies. Harry Potter\'s story begins when he receives a letter and a visitor that change his life. He learns that he is the orphaned son of two wizards and possesses unique magical powers of his own. Invited to attend Hogwarts School of Witchcraft and Wizardry, Harry embarks on an adventure he never could have imagined. The stamps capture the magic of Harry\'s world, with photographs of a few of the brave heroes, fearsome villains, and extraordinary creatures that he encounters throughout his adventures. Best friends since first meeting on the Hogwarts Express, Harry, Ron Weasley, and Hermione Granger face new challenges each year they attend Hogwarts.